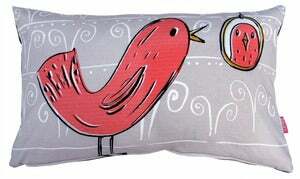 I just fell upon these adorable cushions (pillows) designed by textile designer Becky Baur from the UK. 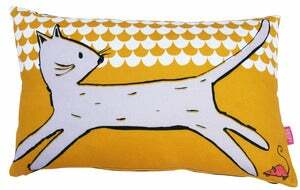 Her collection features some pretty quirky animals that just need to be in a little ones room! There is no need to explain them any more then that…you just need to see them! How cute are they? They are definitely pieces you could base your nursery or kids room after. 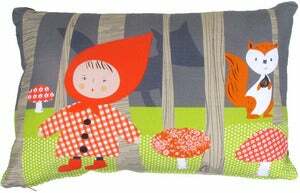 The little red riding hood one…so fun! 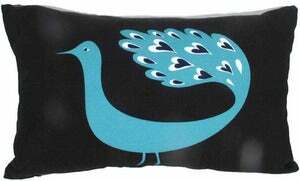 Or the peacock pillow, its so simple, but love the hearts in the feathers. 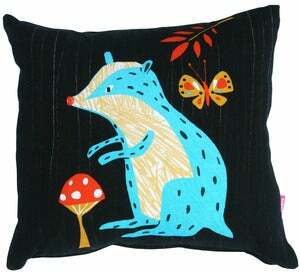 And that woodland badger…I could have fun creating a space with that pillow. Happy Cinco de Mayo…hope its been a beautiful Saturday for you all! These are too cute! The first and last ones are my favorite. Im a new reader, love your blog!